Hi Everyone. It’s me, Carma! I am a writer for OHS and I am going to write several upcoming articles about fun doggy places and stuff to do in Owensboro. I look forward to all the fun places that we are going to be talking about. 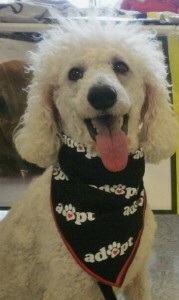 I a 6 yr old standard poodle. Most people that see me say “wow that’s a big poodle” but I am not that big, I was the baby of my dog family so I am smaller than most standards. I had a rough start to my life. I was born In Ft. Lauderdale, Florida and ended up in Evansville, Indiana. I had 2 abusive homes before I got to Evansville. I was at a pit bull rescue and I was so afraid that one of those dogs was going to eat me. My foster mom would dye me pink with kool aid – talk about attention! I made a birthday wish and it came true – I wished for a forever home and I got just what I asked for!! Since then I have over come my fears and learned to trust humans, but the best thing I learned is that I have special powers. I can alert my mom when I know she is going to get a headache or her legs are going to go out. My mom has MS, so I have to keep an eye on her. I love to dress up. I have different jackets for different weather and when it snows I love to wear my boots. They keep my feet nice and dry. My mom sews a lot of my clothes. That way they fit really well. I really love my family and they really love me. 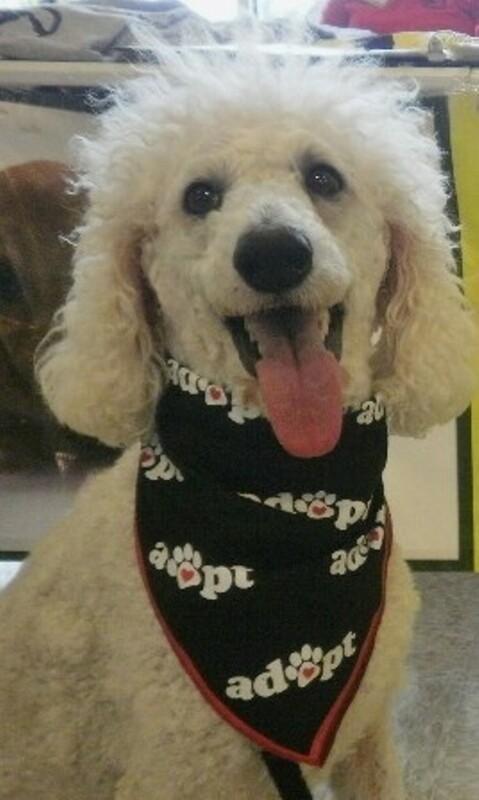 I strive to be the best poodle I can be! I live with my dog parents (Bunny and Dirk) and I have a human sister (Sarah Beth) plus Jenny Sue (cavalier spaniel) and Lil Zen (Chihuahua). Jenny Sue (a rescue dog) is the oldest. She is 9 years old. She went totally blind 5 years ago and no one can figure out why but that doesn’t stop her from playing fetch. She has learned to listen for the where the toy drops so she can find it. She is a great inspiration! Lil Zen is a 3 year old Chihuahua (also a rescue dog). He is handsome. He is the best play buddy you can have. He likes to go with mom and I when we travel sometimes… He loves to run along with me. He sometimes thinks he is a huge dog. He puffs his chest out and struts when a dog comes in our yard and leaves Pee mail. Ruff Ruff !! Personality traits: lovable, kissable, and huggable. Very much loved, happy, kooky, special, silly, demands hug and kisses, loves to give hugs and kisses, mommy’s baby and daddy’s girl, Love to wear clothes. Skills and tricks: I have manners and I know how to use them. I am also mommy’s service dog. I am also great at sniffing out a bargain! Favorite food: chicken, chicken, chicken and more chicken! KFC Chicken gets 2 paws up from me. So now you know a little about me. I hope you and your dog parents will visit the places that we talk about. If you know anywhere that you would like me to talk about or new places to go please write me. My email address is Carmapoodale@gmail.com. I would love to hear from you. I also have a website-> www.CarmaPoodale.com and I am on Facebook and Twitter. I am always up for a car ride to check new places out!